Once you have created all users in your account, you are ready to configure your first project. Here’s how to configure the structure of your first project and assign users to it. To open the sample project, go to Home => Projects > Projects and click the project Number link to reach the “Edit Project” page. This page lets you view the project structure. Use this option if you wish to create a project from scratch rather than using an existing project as the basis for your new project. Fill out the “New Project” page. The following fields are mandatory: Project Number (it is auto populated but you can change it if need be), Project Name, Project Type, Project Status and Project Priority. Click on “Save”. 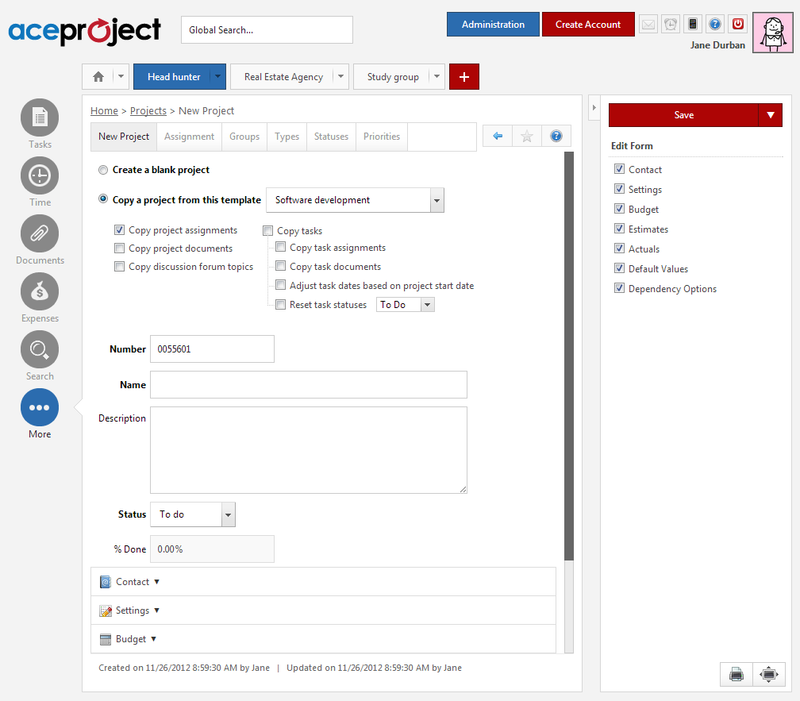 AceProject then shows you the project “Assignments” screen. Click on “Assign a User”. Each user can be granted access rights specific to his or her functions. Learn more about project access rights. Finally, define Task Groups, Task Types, Task Statuses and Task Priorities. These are accessible as tabs in the main frame under Project Tab > Edit Project. See section “Configure the project structure” below for more details. Use this option if you wish to borrow an existing project’s structure (Task Group, Task Type, Task Priority and Task Status values) to create a new project. The projects listed in the drop-down are the ones that have been marked as templates (either “Static” or “Dynamic”). Using this option can be a great timesaver and it ensures the exact same structure is used from one project to the other. You can have AceProject automatically schedule the tasks in your new project by specifying the Estimated Start Date of your new project and checking “Adjust task dates based on project start date”. You may also automatically reset all tasks in your new project to a “Waiting” status instead of copying the tasks with the same status they have in the template project. Enter a name for your new project and click on “Save”. 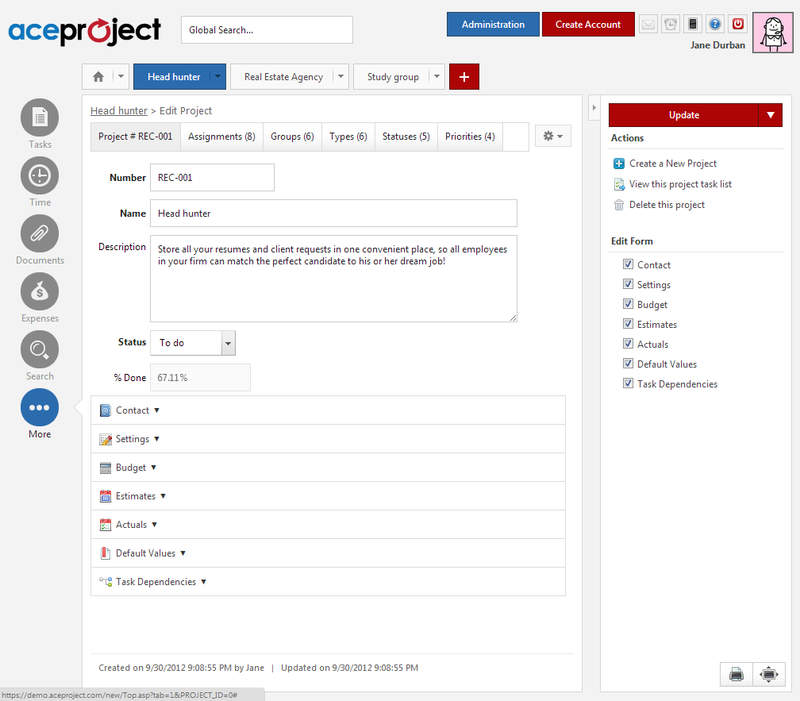 AceProject then shows you the project “Assignments” screen. Click on “Assign a User” if additional users must be assigned to the project. Each user can be granted access rights specific to his or her functions. Learn more about project access rights. This is where you define categories and tags for your tasks. The last four tabs in the “Edit Project Information” page let you configure “Task Groups”, “Task Types”, “Task Statuses” and “Task Priorities”. You can add an item in either of these categories by clicking the corresponding tab and by clicking the “Add a …” link in the corresponding page. They may be used to separate your project in phases or modules. Task groups can also be used to simulate sub-projects. i.e. “Phase A”, “Phase B”, “Phase C”. They may be used to separate your tasks by work category. They are used to inform on the state of completion of each task. A pre-defined “Type” must be associated with each status (Waiting, In Progress and Completed). i.e. “To Do” (“Waiting” type), “Ongoing” (“In Progress” type), “Finished” (“Completed” type). They are used to prioritize your tasks and to define the level or urgency of each task.